Goodbye Columbus: At the end of World Fantasy Convention 2016, I came back from Ohio and my city was NOT gone. So how was the convention, you might ask? Well, as this photo of me shows, the mass autographing session was a lot of fun. You can see a few of the recent Analogs featuring my stories and guest editorials. Another highlight was my panel with David Drake, S.M. Sterling, Eric Flint, & Rhiannon Held on how new archaeological findings influence SF and fantasy. Our panel was both well attended and well received. 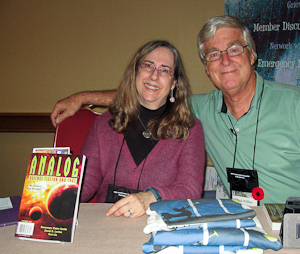 Then too, I got to attend several author’s readings–always a treat! Thank you Camille Griep, David D. Levine, Lawrence Schoen, Rajan Khanna, Kathleen Goonan, and Max Gladstone. Yet, what really stands out the most is several stimulating conversations I had with long-time and recent friends in the field. Perhaps it’s been a while since I’ve noted how much it lifts my spirits to be part of a community composed of many good people, creative people, witty and insightful people, enormously generous of spirit. As we ply our writer’s craft, each of our individual boats is swept along by currents seen and unseen. We call out warnings to one another of the rapids and shoals that lie before us. We applaud one another’s deft navigation. Our flotilla makes its way into the future. 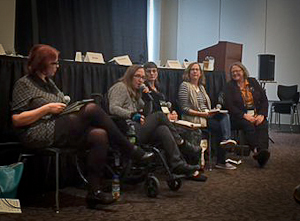 I participated this past weekend on a panel at World Fantasy Convention 2015 in which one of the panelists was in a wheelchair. Problem was that the dais was reachable only by steps, with no ramp. No arrangements had been put into place in advance, even though those running the convention had been apprised of the need for a ramp well beforehand. More to the point, ramps to the stages in all meeting rooms could have been installed as a routine matter. Instead, my co-panelists and I were expected to arrange ourselves such that four of us would be sitting on the dais with the fifth person situated below us. We were never told how exactly we could have the sort of conversation we wanted to have with that type of arrangement. As you can see, we elected instead to move our chairs to the floor in front of the dais where we would all be seated together. In case there is anyone who doesn’t understand why barriers to access are problematic, let me take a moment to explain. These unnecessary hurdles are detrimental to everyone, not just the very person who already has more than enough to contend with when traveling to participate in a convention or conference. Making last-minute arrangements to deal with this is also a distraction that comes just when all presenters are attempting to focus on the topic they are about to address. Failing to make appropriate arrangements is unfair to those in the audience who have come to hear the discussion and participate in it. It also has an adverse effect upon those with disabilities-whether permanent or temporary-who may decide to stay home, having concluded that participating in, or simply attending, an SFF convention is not worth the hassle. Lack of access sends a message that those with disabilities are not welcome in the SFF community on their own terms. That, in turn, harms all of us when we are denied the ability to listen to the voices of those whose perspectives on the world are born of experiences different than those of able-bodied people. What can we do? I implore everyone who is contemplating attending a SF or fantasy convention–not just those with disabilities and not just those expecting to be presenters–but everyone to make inquiries in advance as to what arrangements are being made and what the convention’s policies are with regard to reasonable accommodations for those with disabilities. We all need to make clear that disregard and cavalier treatment are no longer acceptable. One final note: It is not my intention to single out one particular convention or those who gave so generously of their time and energy this year. I truly appreciate their efforts. Rather, this is something that I hope we can work collectively to improve. 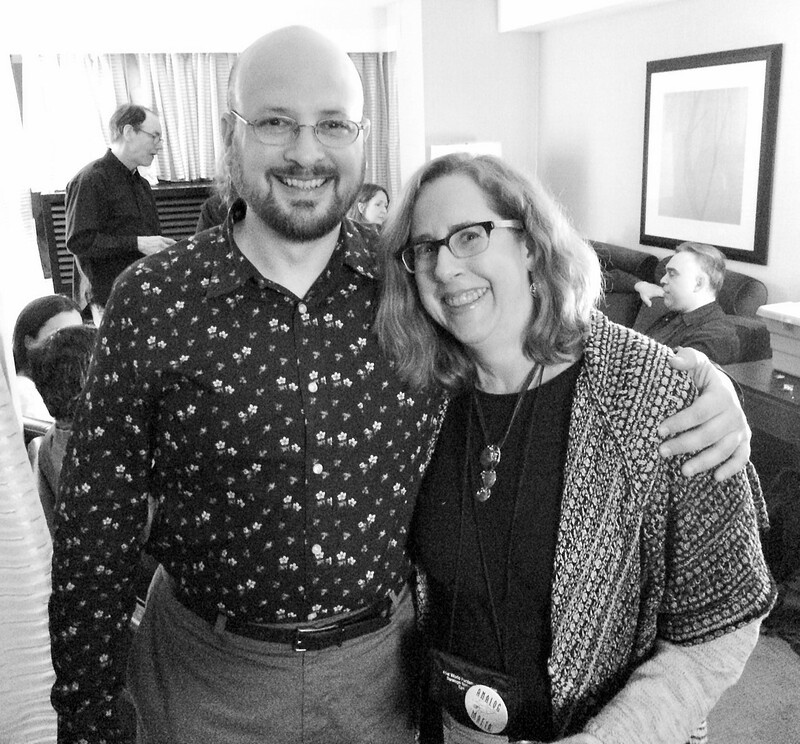 Here’s Analog editor Trevor Quachri rocking the Analog/Asimov’s party at WFC 2015 in Saratoga Springs, NY. 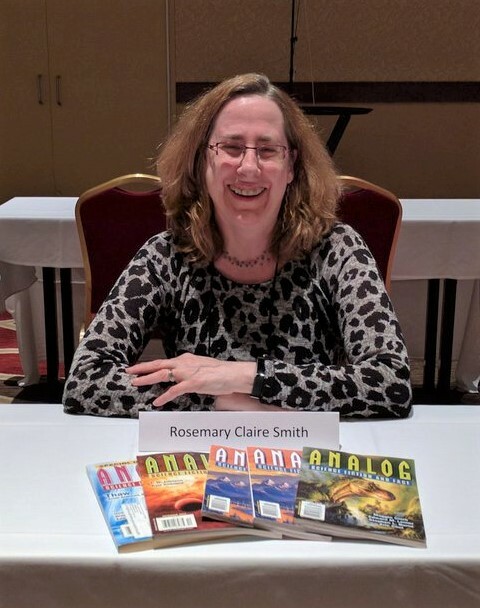 This annual gathering of the clan of fiction writers, editors, artists, and agents focuses on mainly on fantasy, though horror and science fiction have been known to creep into the discussions. Happily, a wonderfully warm Indian Summer has put us all in fine spirits. Then too, Trevor and Sheila and Emily know how to throw a party. Thus far, I’ve participated on a panel about the origins of fantasy stories in myths and legends, which had a variety of interesting perspectives. I’ve also enjoyed panels and readings by several of my writer friends, all of whom were well prepared, entertaining, and generally terrific. I have another panel today about archaeology in fantasy literature. As a former archaeologist, this is a topic close to my heart.